Published May 24, 2018 at 4:01 p.m.
Derek Trucks entered the world in 1979 as the nephew of drummer Butch Trucks, one of the founding members of the Allman Brothers Band. Named for Duane Allman's band, Derek and the Dominoes, Trucks displayed a prodigious talent for the guitar and was fronting his own band in Florida bars and nightclubs by the age of 10. At a show in South Beach, Trucks was stunned when his uncle came onstage to play along with Gregg Allman and guitarist Warren Haynes. After the show, Gregg gave Trucks a bottleneck guitar slide that belonged to his late brother, Duane. When the Allman Brothers Band officially reformed in the late '90s, Trucks became a member of the group and participated in tours and recording sessions. He also married singer/guitarist Susan Tedeschi who had a blues, jazz and gospel-influenced band of her own. Having already shared a stage numerous times, Tedeschi and Trucks felt their marriage gave them the opportunity to create a new band that reflected their talents and the wide variety of musical genres they loved. 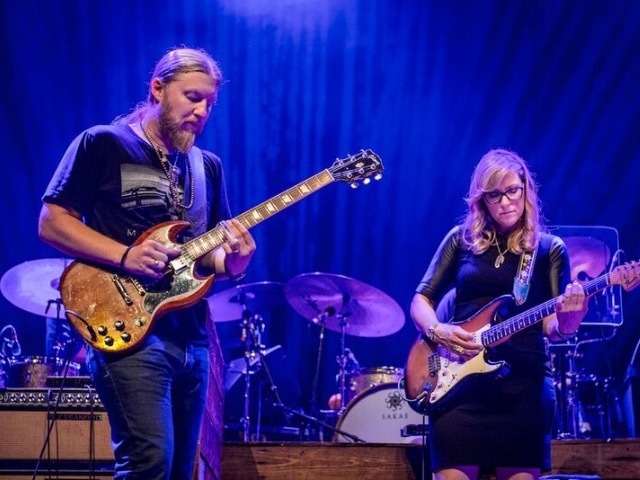 With four successful studio albums and 2017's critically acclaimed "Live at the Fox" behind them, Tedeschi and Trucks began work on their current release, "Wheels of Soul." The band returns to Milwaukee's Riverside Theater on Tuesday, May 29, but before then, Trucks spoke with OnMilwaukee in advance of the concert. OnMilwaukee: You weren't even a teenager when you formed a band and played 200 shows a year. That's almost unheard of. Derek Trucks: (laughs) Yeah, it's a pretty crazy way to grow up, especially when you find yourself on stage with legendary musicians who are three or four times your age. I learned to play the guitar at at a pretty early age, but I quickly realized that this talent was something I'd been given. It was a gift, and it was my responsibility not to waste it. So yeah, I traveled a lot, but I did all my schoolwork on the road, and I had a lot of mentors who helped me keep my head on straight. I was 14 years old when Gregg let me to drive his Corvette, and he told me to always be careful. I thought he was talking about the car, but then he rolled up his sleeves and showed me his arms. "I'm talking about this," he said. "Don't make the mistakes I made. Stay away from this sh*t." I've never forgotten that. I've spent my life around incredibly talented people, and I've been given a chance to see some of the mistakes they made and not repeat them in my own life. The Allman Brothers Band had a lot of musicians come and go in 50 years, but it would seem that's pretty much done now. Oh yeah, Butch died in January last year, and six months later, Gregg was gone. The Allman Brothers are over. That's it. You simply cannot replace a voice like Gregg's. There's no point in playing those songs with someone else singing them. We all just have to move forward. I read something after Gregg's death that said there were thousands of people on the streets of Macon the day of the funeral. There's an intense history between the Allmans and the city of Macon that goes way back. Gregg's funeral procession traveled through town to Rose Hill Cemetery where the family has a beautiful garden plot. Duane was buried there in 1971, and Berry Oakley the year after. Geraldine "Mama" Allman's ashes are there, now Gregg is buried there as well. It's truly the end of an era. You married Susan when you were 20. But that wasn't some crazy teenage romance. You guys are soulmates. You are so right. Everything we do is about family and togetherness. Susan and I provide balance to each other without even trying. That's just how it is. We have two kids, and they attend public school in Florida if they're not on the road with us. As a band, we try to do about 200 dates a year, mostly in summer when the kids aren't in school. As it is, the hardest thing about being a parent is the moments you miss while the kids are growing up. How is a band as large as yours able to function so smoothly on stage night after night? I wondered about that years ago when we had eight members. Now we have a 12-piece band, but there are no real "stars" on that stage because everyone gets a chance to step up and sing or take a solo or whatever. Susan's got an incredible voice, but we're fortunate to have other people who can sing like crazy. Also, we never play the same show twice. The setlist is constantly altered to keep things fresh.